This is our third instalment of the series on Working with Presenters. The first article covered “Approaching Potential Presenters” and the second one dealt with “Confirming Presenters“. This article will offer suggestions on how work with Presenters “On the Night” to provide the best experience for the Presenter, your Members and the Meeting Co-ordinator. This can actually be the hardest hurdle to handle, because you don’t know exactly when the presenter will arrive and you, as the Meeting Co-ordinator, will probably have many other responsibilities on the night, so you can’t afford to loiter around the main entrance to the venue (or the venue may have multiple access points) waiting for your guest presenter to arrive. But if you don’t handle the greeting properly, it can ruin the rest of the meeting as the Presenter may end up feeling uncomfortable or out of place, not knowing what is happening next, where things are etc. Don’t worry… most User Groups have a table setup near the main door to handle membership applications and renewals, sometimes to hand out name tags or to take the entry fee, etc… so when sending your Confirmation Email the day before the Presentation, direct the Guest Presenter to introduce themselves at this table. Then have who ever is staffing this table to get another member to lead the Guest Presenter directly to the Meeting Co-ordinator or the meeting room. If your Meeting Co-ordinator is not in the meeting room have the Guest Presenter take a seat and get the volunteer to quickly find the Meeting Co-ordinator, or another member of your Committee to welcome the Guest Presenter and help them set up. If possible, quickly introduce the Guest Presenter to at least one or two other members of your Committee prior to the meeting commencing. But don’t go overboard at this stage… a simple “This is David, our President” will often suffice at this stage. In all likelihood, your Guest Presenter is only going to remember the persons face and if you are lucky, their name. Further below, you’ll see why this can be important. This can be tricky when your User Group only has access to a single room for your meeting, but if you have access to a foyer or secondary room, seriously consider not allowing your members into the meeting until 5-10 minutes before the presentation part of the meeting is to commence. This will allow the Guest Presenter to setup in peace and quite, without distraction from your members – as many members will attempt to ask questions of the presenter prior to the presentation, when the Presenter’s primary focus will normally be on actually setting up and testing their equipment. If you only have access to a single room, train your members not to approach the Guest Presenter prior to the presentation! Have your members take their seats directly. Consider having a rope, or something similar, to “barricade” access to the “stage area” that can then be taken down just prior to the meeting officially commencing. If possible, perhaps consider having a “Green Room” available for your Guest Presenter to retire to for a few minutes prior to their presentation. This can allow them a few minutes of peace and quite to relax and calm down, which can be gratefully appreciated by many Presenters. I’ve seen some groups simply use the small “storage room” off the main room where all the tables and chairs are normally kept when not in use for this purpose. Another group even offered access to the venues disabled toilet* or baby changing room – Don’t laugh! these rooms can work quite well as a “Green Room”… it gives the presenter a chance to go to the toilet before they take to the stage. It also allows them to take some mouthwash if they wish, apply deodorant or perfume, or even change their shirt or shoes. Most importantly, the disabled toilets or baby changing are always larger than regular restrooms so the Presenter has the opportunity to move around a bit and as they are normally separated from the regular restrooms, they offer a greater sense of privacy. This is an important part of the evening and a few simple tips can make it all the more successful. Prior to the presentation find out how the Presenter prefers to be addressed. For example my name is “Nicholas” and socially I respond to either “Nicholas” or “Nick” so personally I’m not fussed how I’m addressed… but some presenters are!!! and although their business card and formal email signatures may state a “full” name, in conversation they may prefer a shorter version… alternatively they may be offended if you abbreviate their name – so find out which they prefer and stick to that. When your President, or Meeting Co-ordinator, are introducing the Guest Presenter to your members, don’t go overboard with a long list of the Presenters’ credentials – keep it short and to the point! After all, the audience have usually come along to hear the Guest Presenter talk about the topic, not to the MC prattling on about how great the Presenter is. That said, a few short words establishing the Presenters’ credentials is certainly warranted — just don’t overboard. Prior to the presentation, feel free to ask the Presenter themselves to provide you with two short sentences that you can use to introduce them. Do not try and shake the Presenter’s hand at this point of time! Often they are nervous and their palms are most likely to be very sweaty. They may also be holding a remote control in their hand ready to jump straight in to the presentation. If you have used a slide show for the “Club Announcements” section of the meeting, then include a slide introducing the Guest Presenter… keep it simple – often just the Presenter’s Name, the Company they are representing and Topic they are presenting is all that is needed. Most User Groups offer at least tea, coffee and biscuits and sometimes a little more… either just before and after their meeting, or during a break in between presentations. Regardless of when you hold your Coffee Break, it is recommended that you appoint a different person from the “Meeting Co-ordinator” as a “Catering Officer”. There are a couple of reasons for this… the Meeting Co-ordinator’s primary focus should be on your Guest Presenters needs for the actual presentation and they should be available to help the Guest Presenter setup and pack up… especially if you have multiple presenters. They shouldn’t be worried about serving tea and coffee to your members! The Catering Officer, or their assistant, can quietly approach the Guest Presenter shortly after the presentation finishes and ask them if they’d like a cup of tea or coffee and if so, how they have it. Then this should be delivered to the Guest Presenter, ideally in a ceramic cup with a handle with a saucer (even if your own members use foam cups) as it can be easier for the Presenter to hold and put down on a table. Once the Presenter has finished the drink, have the Catering Officer collect the empty dishes so the presenter doesn’t have to worry about where to take it. Reserve a couple of seats in the front row of the meeting room for your Guest Presenter, and any of their entourage, to sit in before their presentation commences. Also, remember to reserve a seat or two for your President, or who ever is formally introducing presenter to your members. If you have multiple presenters at your meeting, reserve a few seats at the rear of the room (or near the door) to allow your “second” presenter to quickly and quietly sit if they are running late or if they need to sneak out during the first presentation to start preparing for their presentation. I highly recommend that you reserve a seat for the Meeting Co-ordinator at the rear of the room or near the door! This allows them to quietly exit to greet the next presenter if they have arrived late or to perform other tasks. Just as importantly, it can allow them to become a new focal point away from the stage if required. You’ve all experienced meetings where things don’t quite go to plan and the presenter may need a minute or two to fix a technical issue… and many presenters freeze up if the entire room is staring at them as they try to fix the problem or fumble about. If your Meeting Co-ordinator, or another Committee member with a strong commanding voice, is at the rear of the room then they can make a comment to the audience and you’ll find that the majority of people will turn their heads towards the new speaker, taking attention off the primary presenter as they fix the technical issue. Likewise, it is strongly recommended that you try and spread your Committee members around the room… all too often I see all the Committee members of the User Group sitting together in the very front row and this isn’t always the best place for them. If they have to get up and speak at the beginning of the meeting (often groups have their Secretary get up and make a few announcements (like promoting the Disc of the Month) and then perhaps the Treasurer gets up to remind members that their annual fees are due, so the President or Meeting Co-ordinator doesn’t have to be the only person presenting), then reserve a seat for them in the front row or on an aisle seat close to the front so they can quickly get to the “stage area” but then have them return to another seat somewhere in the middle of the room. Why bother I hear you ask??? Simple — it is a subtle way of having your Guest Presenter to “know a few friendly faces in the audience” because you have either introduced them prior to the meeting and/or they have just seen them up on stage prior to their own presentation. This can help ease any tensions the Guest Presenter may have, by allowing them to focus on these people “they now know” for making roving eye contact with the audience, rather than staring at a room of “total strangers”. It is still advisable that at least one of your Committee members remains in the front row, or on the aisle close to the front, so that if there is a technical issue, they can get to the stage quickly and with minimal fuss to assist the Guest Presenter. Also some meeting venues have controls for heating, air con and lighting in strange places – if yours does, then have someone who knows how to use them sitting close by these controls. There will always be questions arising from a presentation, but different presenters handle them in different ways and it is best to ask the Guest Presenter before they commence which is their preferred option and then when introducing the Guest Presenter you can announce to your members that “Jack will take any questions at the end of the presentation. Please wait until then before asking your question” or “Rebecca is happy to take questions during the presentation. Please raise your hand and wait for Rebecca to acknowledge you before asking your question”. Some presenters welcome questions any time during the presentation. If this is the case, have your members simply raise their hand and wait to be acknowledged by the presenter before asking the question. Don’t fret if it takes the Presenter a moment or two to acknowledge the raised hand – they could either be in the middle of an important section of their presentation or they may not immediately notice the raised hand, especially if you are in a large, darkened room. Other presenters prefer to have all questions asked at the end of the presentation. If this is their preferred option, honour it. It can throw some presenters right off their flow if they are interrupted mid-presentation. Normally this sort of Presenter will display a “Q&A” slide at the end of the presentation, which signals now is the time to ask questions. Again, have your members use the raised hand to signal they have a question. A small percentage of presenters will offer to take a short question or two at the end of each section within their presentation or just after a “live demo”. I have one colleague who utilises this method regularly, as it gives them a chance to take a sip of water while listening to the question, without seeming to break the flow of their presentation. Another area to be aware of during Question Times is the “I NEED!!! Support NOW!!! Hijacker” – you know, that individual who has attended your meeting with the sole purpose of having their support question(s) answered then and there – and don’t want to take “No!” for an answer… we’ve all encountered them, but few groups handle them well. The Hijacker will ask a detailed question about a particular question that is usually related to the topic at hand, or just as commonly it can be related to another product sold or supported by the Guest Presenter’s company but is not the topic of this presentation. Usually the question(s) are unique to their own personal circumstances and are of no relevance to anyone else in the audience but the Hijacker themselves. The Guest Presenter will usually try to answer the question or will politely ask the Questioner to see them after the presentation so they can talk one-on-one, but then the Questioner mutates in to the “Hijacker” badgering the Guest Presenter for a detailed response then and there. This is where the leadership of the User Group need to step in – FIRMLY! Remember 95% of the time you’ll know who that person is as they’ll be a member of your group and you should be able to refer to them by name, which in itself can be a calming effect on them. My suggestion is have your Meeting Co-ordinator* to firmly say “Fred (The Hijacker), that seems a detailed question that would perhaps be best answered after the presentation, or maybe you could send me a copy of your question and I’ll make sure John (the Presenter) gets a copy of it and he can follow up with their tech support people.” and this can placate many Hijackers as they now have a “personal point of contact”. As suggested above in the Reserved Seats section, we suggested that the Meeting Co-ordinator sits at the BACK of the meeting room… now by having them make the initial request to follow up after the presentation, most people, including the Hijacker will turn to the rear of the room to see the person talking and this simple task can break a Hijacker’s will to continue pursuing their question(s) then and there and you should find that they will now actually wait until after the presentation. If the Hijacker continues badgering the Presenter, then you can move up the “chain of command” and authority and have the President actually stand up and quite forcefully, but still politely, restate that these particular questions should happen after the presentation and that the rest of audience have come along to hear the Guest Presenter speak on the topic at hand, not an individual’s question. If you have someone who has morphed in to a Hijacker during the presentation, be aware that they may continue to try and dominate the Guest Presenter after the presentation – so ensure a member of the Committee is on hand with the Guest Presenter at all times and if the Hijacker does rant on for too long, then have that Committee Member interrupt them again by suggesting that this topic is obviously too detailed for a quick resolution here and that they would be best to email the details to the group’s Meeting Co-orinator (we are working on the principle of ONE contact from the User Group with the Guest Presenter) and they’ll followup with the Guest Presenter. Ensure that you have someone appropriate available at the conclusion of the presentation to thank the presenter for their time and efforts in presenting to your group. I hear many of you saying why am I even mentioning this… of course we thank our presenters. But from experience I’ve seen some groups make mistakes with this simple task. So ensure you have someone else delegated to be the Catering Officer… and have a backup person available to stay the Thank You if the primary person is called out of the meeting for some reason – the next logical solution would be your Meeting Co-ordinator, but any Committee member should be able to perform this task. When thanking the Presenter, don’t hesitate to actually shake hands with the Presenter, regardless of the genders of either the “Thanker” or the Presenter. It is a small gesture but it actually speaks volumes for showing how well the Presenter was accepted. Some User Groups also present a small “Thank You Gift” to the Presenter at this time. This is totally optional, but again it another small gesture that can go a long way… I’ve see User Groups present a mug with their User Group Logo on it (a subtle play on Macintosh User Group 🙂 ) or a thumb drive or pen with the groups’ logo and web address on it. If your local area is famous for a particular item like cheeses or wines, consider a small hamper of local produce. But remember this is totally optional – most presenters don’t expect it, but it is a nice thought particularly if the presenter has travelled a fair distance or given up a weekend to present to your group. Also consider how the Guest Presenter is travelling… do they have a flight afterwards? Can they easily transport your gift home? Once the Guest Presenter is ready to leave the meeting venue, either have the Meeting Co-ordinator or another Committee member walk the Guest Presenter to at least the building exit, and preferably, all the way to their car. This can be a great opportunity to have a final quite word with the Guest Presenter, without other people listening in. Sometimes you’ll find the Guest Presenter will be prepared to pass on extra information regarding their companies products “on the QT” when there is just one or two individuals present. 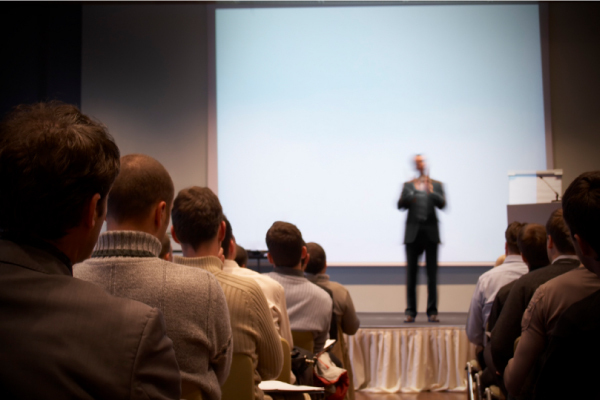 I’ve personally experienced instances when Presenters have remained quite in the Presentation regarding release dates of new products, but when I’ve walked them out to their vehicles, they have suggested that if our group’s members were interested in learning about the updated, or new, product that the Presenter would be interested in returning to give another presentation in such and such month. The other reason for walking the Guest Presenter to their car is it can be seen a polite and respectful gesture by showing that you didn’t stop caring about them as soon the presentation was over.